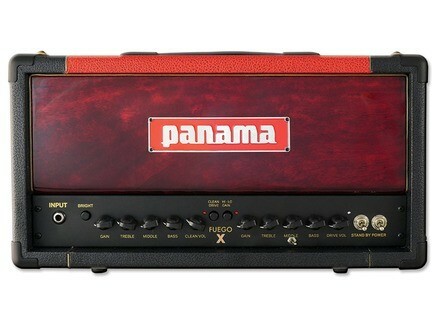 Fuego X, Tube Guitar Amp Head from Panama. The Fuego X is described as a stripped-down 15-watt all-tube amplifier. 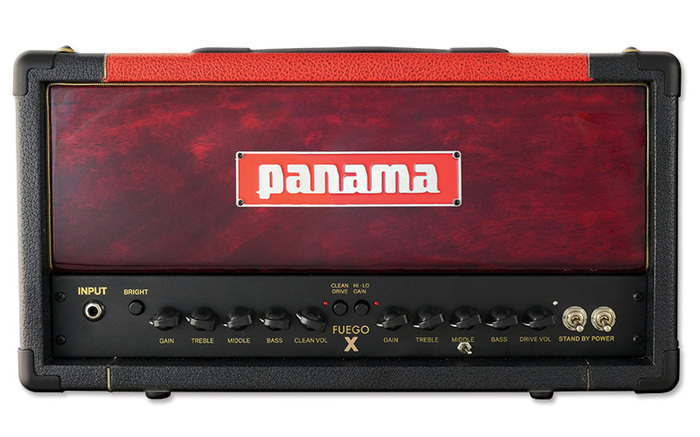 Reportedly based on customer requests for a higher gain version of the Fuego, this smaller model features a re-voiced high-gain channel and is said to deliver especially flexible tones, with 2 banks and 3 foot-switchable channels - with each bank featuring independent Gain, Treble, Middle, Bass, and Master Volume. The 2 dirty channels are foot-switchable and have a shared EQ with a (US/UK) tone stack shift switch allowing a larger palette of tones, from classic-rock on the dirty-lo channel to classic “brown” & modern high gain tones on the hi-gain channel. As for the clean channel, it features normal and bright modes to deliver a wide array of clean and crunch tones. The Fuego X comes equipped with a transparent effects loop, preamp out, power-amp in and 4,8 and 16 ohm speaker outputs, all enclosed in a Spanish Cedar and Mango-wood cabinet handcrafted in Panama and wrapped in the manufacturer's signature two-tone Antique Graphite and Scarlet Tolex. Available now for pre-order, the Fuego X is expected to ship to the U.S. in late April with a street price of $599. Walrus Audio Luminary Quad Octave Generator Walrus Audio presents the Luminary Quad Octave Generator pedal, which features four octaves and three onboard presets. Empress Effects introduces Buffer+ Stereo Empress presents the Buffer+ Stereo, designed as a complete I/O interface for your pedalboard while maintaining high signal fidelity. Review of the Electro-Harmonix Lester G Deluxe Rotary Speaker pedal One of the new pedals Electro-Harmonix debuted the 2016 NAMM show was a Leslie-speaker simulator called Lester G. Not only does it offer rotating speaker sounds, but also an overdrive circuit and a compressor.